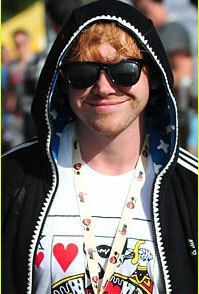 Today our Celeb sunglasses spotter has spotted one of our favourite Harry Potter stars, non other than Ronald Weasley (Rupert Grint) living it up in Las Vegas in his Ray Bans! Maybe he was trying to work his magic in the casinos, what ever he was doing he certainly deserves a rest after all those years on the Harry Potter films. This entry was posted in Celeb Sunglasses Spotter!!. Bookmark the permalink.